Help your family or yourself breathe easier by using waterless vaporizers. Instead of having to fill a water tank, all you have to do to operate these vaporizers is insert the vapor pad and turn it on. This makes them simple to use and ideal for when you don't need the added humidity of a warm mist humidifier. 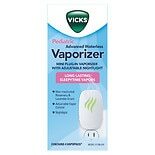 Choose a waterless vaporizer for health and comfort from brands such as Vick's and Vapor-Eze. Depending on your needs and preferences, you can choose between waterless vaporizers that are free-standing or go with a plug-in model. These vaporizers release soothing vapors of natural oils and other ingredients such as menthol oil and eucalyptus oil. The vapor pads for many devices can work for up to eight hours. 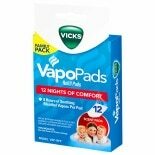 Look for the refill pads that are compatible with your waterless vaporizer to keep your family comfortable and breathing easily. Here at Walgreens.com, you can find additional options for staying comfortable throughout colds and flu. We carry vapor rubs to apply directly on your skin for soothing relief. If you could benefit from added humidity in dryer, cold months, consider different types of warm humidifiers and vaporizers. You can use water in these alone, or add a medicated oil for comforting vapors.